Fifty years ago Bishop of O’Boyle journeyed from Ballina to Enniscrone to dedicate this Church to the worship of God and the service of the people of this parish. Six months later, he journeyed from Ballina to Rome, where in October 1965, he joined three thousand bishops from all over the world who gathered with Pope John XXIII, to close the Second Vatican Council. This church, therefore, was planned and built in a time of waiting for the Second Vatican Council and has lived its life in its aftermath. In truth, it has experienced a half a century of truly momentous change in the life of the Church worldwide and, in particular, in its life in Ireland. We gather, therefore, today to remember the past; to thank God for its strength and to beg pardon for its weakness. Today we also ask God’s blessing on a future which seems to have within it elements of great uncertainty as well as great hope. But we face that future with the confidence which comes from the words of Jesus echoing in our minds: “I am with you always, yes until the end of time”. 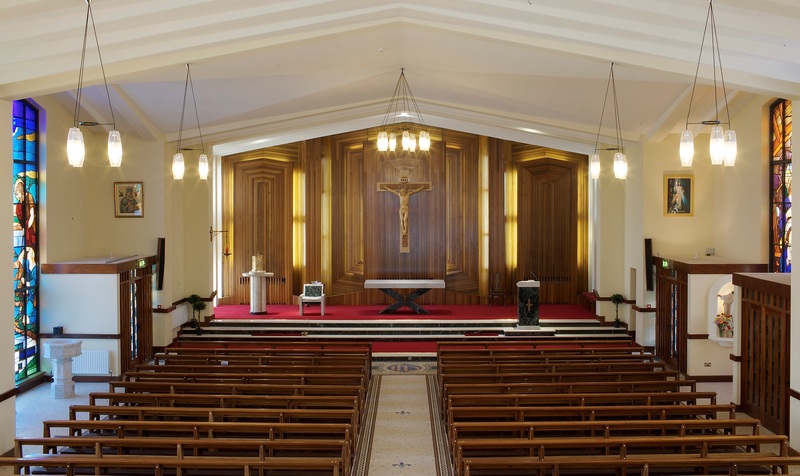 In 1965, when this church was blessed, the catholic life of this parish was flourishing. Two priests served here. They ran the schools, managed the money, kept a certain distance from the people and never heard of Parish Pastoral Councils, Parish Finance Committees, Boards of Management or Local Safeguarding Representatives for child protection. Attendance at Sunday Mass was high. The Sisters of Jesus and Mary lived in their convent beside the Secondary School. From there they served this community in both the Primary and the Secondary schools. The generosity, for which Enniscrone has always been known, ensured also that this newly built church was paid for in record time. To all eyes, therefore, the life of this parish was vibrant, with little sign of any impending clouds. Fifty years later much is changed and much of that change is to be welcomed without reservation. Lay involvement in the life of this church and of the parish is exemplary, with generous people volunteering their time on Boards of Management, in the area of child safeguarding, of financial management and so on. However, fears for the provision of clergy to serve in the parishes of the diocese is a growing concern, the nuns are now reduced to six in number, a younger generation lives at a greater distance from the Church and the level at which the Church in this community will find itself in the future cannot be predicted. Some people feel that we are living in an era when the Church has lost or almost lost its relevance; where people seem to believe without wanting to belong to a believing community; where they foster a spirituality without adherence to any religion, have faith without being a member of Christ’s faithful and have Christ without his Church. And so some drift from the Church, some get mad with her, others grow lax or just give her up altogether. And if this does not cause us to take a radical look at the future I don’t know what will. And we face the future one of the pressing challenges which faces all of us, lay and clerical, is how to renew the appeal of the Church and, in particular, the catholic conviction that Christ and his Church are one. Today, as we mark the fifty years of service given in this church, let me reassure you that the Church has a future in this country and worldwide. However, that future must go behind the outward form of the church and rediscover its core. And the core of our belief and of our church is the person of Jesus Christ. Our religion is not based primarily on rules and regulations, on opinions, issues and controversies. Our religion is based on a person, the person of Jesus Christ. We believe in Jesus Christ, the person who walked the roads of the Holy land teaching, healing, saving, serving, inviting and loving. Jesus, who was also bruised, derided, rejected, cursed and defiled. And the Jesus we preach and to whom we have given our lives is this human, loving, ever present and ever caring person. And it is this Jesus which resonates in our hearts and in the hearts of very many people who believe and yet find it difficult to cross the threshold of buildings like this church. When I wonder about the future of the Church in our country, I often think of the comment of the girl to the ‘whiskey-priest’ in the novel The Power and the Glory. Graham Greene wrote “The child listened intently. She then said, ‘Oh, I see, like a birthmark.” Our Church is like a birthmark. After over fifteen hundred years, it is in our DNA and this DNA reflects in some way the assurance of Christ to Peter, “Yes I am with you always, to the end of time”. In a real sense, I believe that our faith is bound up with the history of our spirit. As this church now faces the second fifty years of its life and what might appear now to be an uncertain future, we have this double reassurance. God is always with us and this church is bound up with the history of the spirit of our people. Despite the uncertainty, the future is bright but the brightness is founded on the person of Jesus; who he was, what he did and what he said, rather than only on the outward form of his body, the Church. It must also be founded on a real awareness of who we are; sinners who are saved by Christ, not just people who appear to be saints but who are inwardly sinful; believers who are constantly tempted into unbelief and, above all, human beings, frail and fallible, yet created in God’s image, loved by God and loveable. If we in our time contribute our share of faith, hope and commitment to the people of this parish, and especially to the young, then I believe this church will stand the test of time and will still be here to mark its centenary, fifty years from now.